Macroscopically, AT/RT resembles medulloblastoma and sPNET. The tumors are soft, pale pink and show areas of hemorrhage as well as necrotic regions. Very commonly rhabdoid cells characterized by eosinophilic cytoplasm, large nuclei with excentric nucleoli and a prominent membrane as well as cytoplasmic eosinophilic inclusion bodies are seen. These diagnostic cells may be grouped in nests close to areas composed of neuroectodermal, mesenchymal or epithelial tissue types. Only about 10 to 15% of AT/RT consist almost exclusively of rhabdoid cells. AT/RT exhibit a broad spectrum of immunohistochemical reactions corresponding to the different tissue subtypes. 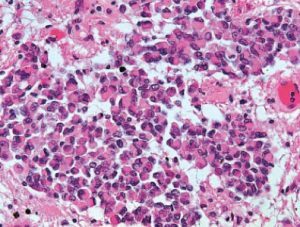 Rhabdoid cells are characterized by expression of vimentin, EMA (epithelial membrane antigen) and cytokeratins, less commonly by SMA (smooth muscle actin). The immunohistochemical demonstration of lost INI1 protein expression in the tumor cells is a strong indicator for AT/RT, however, rare AT/RT with preserved INI1 expression are also on record.